Every sales leader wants to find the best, quickest path to sales productivity, especially for their new hires. 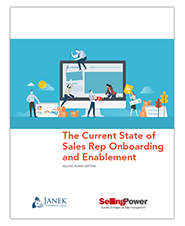 This report reveals new research (conducted by Selling Power and Janek Performance Group) and provides a clear snapshot of the current state of onboarding and enablement. The report also reveals specific advice on how sales leaders can improve their approach to onboarding.